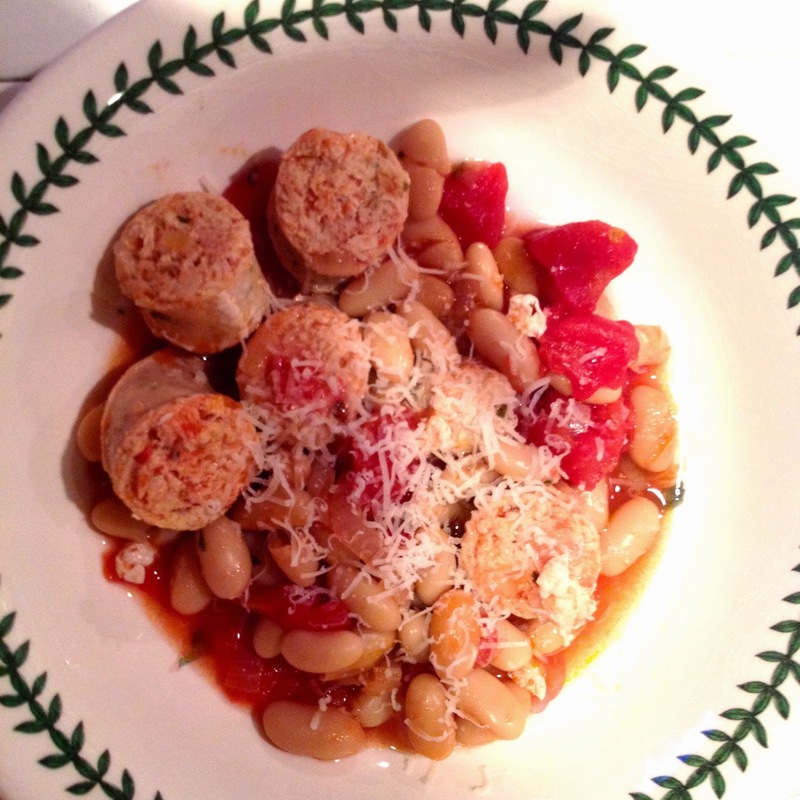 Spicy Chicken Sausage Stew with White Beans. Cool morning temps always put me in the mood for soups and stews. I love to create a filling, healthy, low calorie soup or stew to fill my craving for cool weather food. I love this Sausage Stew since it is so filling but healthy at the same time. Red pepper flakes and white wine added make this a spicy flavorful stew! Preheat oven to 375F. Spray a grill pan and cook sausage on stove medium heat for about 20 minutes, turning occasionally. Set aside to cool. In a dutch oven place oil, garlic, and shallots sauteing until tender about 3 minutes. 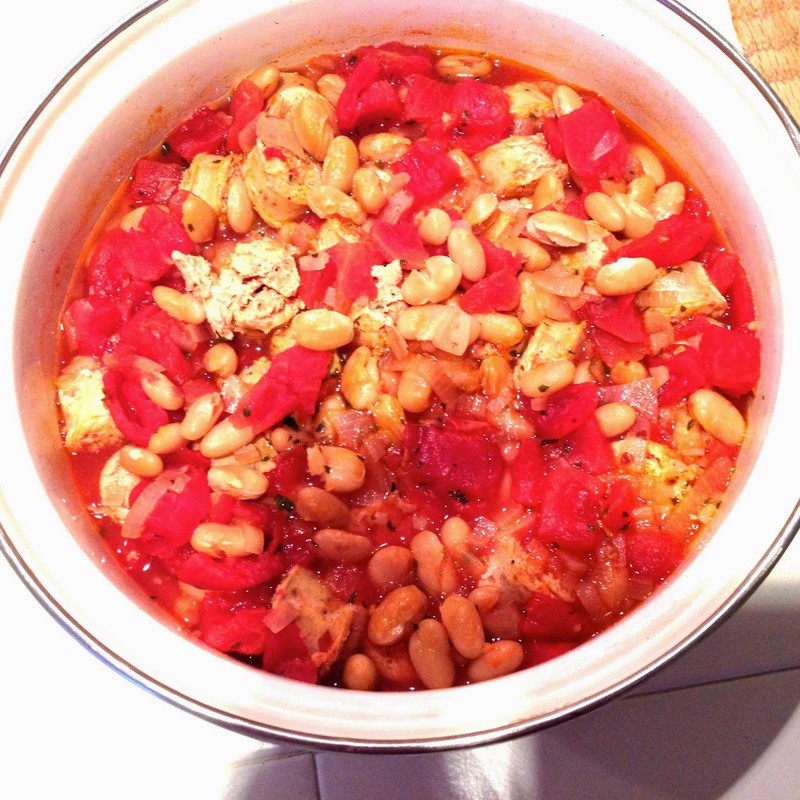 Add tomatoes, beans, wine, chicken broth, salt and pepper flakes. Continue to saute on medium heat for about 5 minutes. Put tomato mixture in baking pan and bake cover for 20 minutes. Remove from oven, add sausage. Spoon stew into soup bowls, pass the Parmesan cheese. So good and easy. Serve with a nice green leafy salad and fresh crusty bread. Oh, don’t forget a nice dry white wine!